Design-wise, the Nokia 9 is your regular dual-glass smartphone but with a twist – there is no camera hump. That’s right! 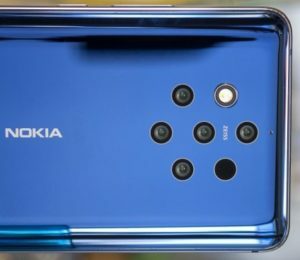 Despite having six cameras on the back, the Nokia 9 is completely flush and it’s all while keeping a thin profile of merely 8mm. So, the Nokia 9 PureView relies on two pieces of Gorilla Glass 5 to keep the screen and the back side safe, while a polished frame made from 6000 series aluminum keeps the whole thing together. This is what we’d expect from a glass smartphone and HMD’s done it by the book. The 5.99″ OLED screen is naturally your gateway to the Android world. While it doesn’t have any trendycutouts, it is of wide 18:9 aspect ratio and flagship-grade Quad HD resolution. There is also an under-display fingerprint sensor, too, which seems to be the way forward for this type of biometric security. The bezels are thin but not impressively thin. There are top and bottom thick bars, but we actually don’t mind those. The top bezel has the earpiece, a couple of sensors and the 20MP selfie camera. The chin below the screen does help for usability and mistouch prevention when typing on the virtual keyboard. There is no curve on the front Gorilla Glass 5 and by now the 2.5D finish has become a standard. There is though a beveled edge around the frame that improves the grip and makes for a nice contrast over the semi-glossy finish. Unfortunately, the glossy frame is very slippery as is the curved glass back and the only thing preventing the Nokia 9 from sliding out of your hand is the bevel we mentioned above. And slide it will, as soon as you place it on any sloped surface. We strongly recommend getting a case to improve the grip if not for anything else. 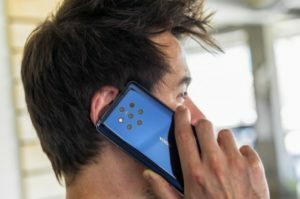 The back of the Nokia 9 PureView has a trendy curve. It is also made of Gorilla Glass 5 and ends on tapered edges on all sides. The first ever six-camera setup looks very elegant being flush with the back and very intriguing. 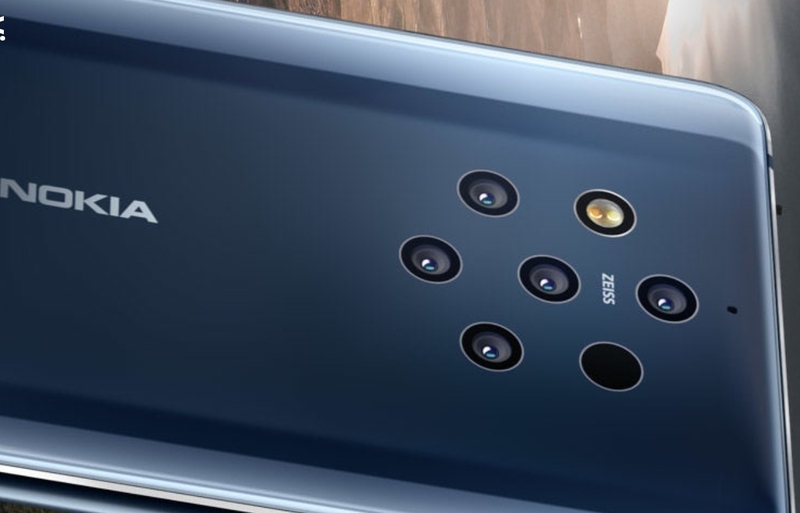 There is a total of seven punch holes on the Midnight Blue back – one for the dual-LED flash, five for all those 12MP cameras, and one for the ToF camera. The flash hole is the only one to have a tiny metal ring around. We just hope nobody gets a trypophobia because of this pattern. Haven’t heard of trypophobia before? Yes, it’s thing, but if you don’t find anything wrong with the arrangement of the multiple holes on the back of the phone, you are fine. There is no need to Google it. You did it anyway, didn’t you? Indeed, this is one very unconventional camera setup and we will go into details in a bit. The SIM tray is up at the top of the phone across from a microphone. In fact, the phone has three mics in total: one at the top, bottom, and on the back just above the cameras. 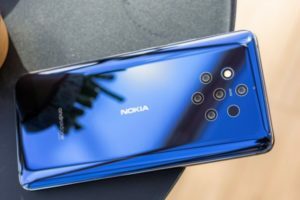 The Nokia 9 is waterproof, rated IP67 to be specific, and for this or completely different reason – it lacks an audio port. The phone measures 155 x 75 x 8 mm and weighs 172g. It looks a lot like the LG G6 at the front, but it’s actually 6mm taller and 3mm wider than the G6. 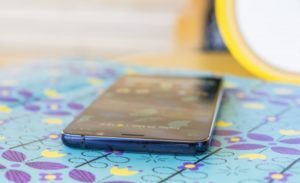 The Nokia 9 feels sturdy in-hand and its weight is well-distributed. The curve in the back glass offers a nice shape when holding the phone and the bevels around the frame add to this effect for sure. But it is as slippery as it looks and for a phone that will be used as a camera more often than as, well, a phone, protection is a must. The Nokia 9 isn’t that large as a phone and fits easily in most pockets. Its slim profile helps a lot, too. 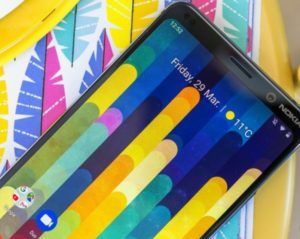 We appreciate HMD’s decision to put a 5.99″ screen instead of 6.5+ as it often happens. For a cameraphone, size does matter and the Nokia 9 is rather spot on when it comes to usability in spite of its slipperiness. So what’s the damage? Not as bad as Samsung and iPhone comparables, coming in at a MRSP for USA of $699 at BestBuy and there will be your typical discounts like a $100 off from HMD.